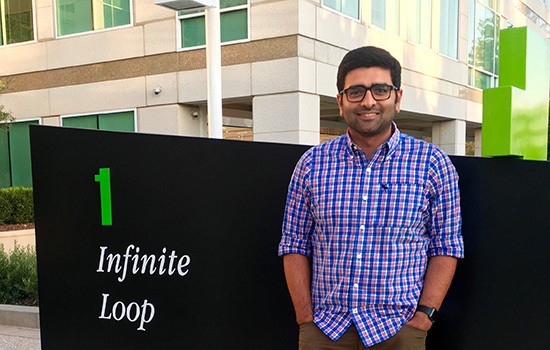 Siddharth Khullar ’09, ’13, Apple Inc.
Siddharth Khullar ’09, ’13 (electrical engineering, imaging science) sees a healthy future in wearable devices that help consumers monitor their activity and wellness. Khullar, now a senior researcher and product innovator at Apple Inc., integrates algorithms and sensing devices in products that advance human-machine interaction and wellness computing. Drawn to the medical field—but not to medical school—Khullar learned the “engineering-side of medicine” at RIT. He developed a hybrid skill set from his MS in electrical engineering and then his Ph.D. from the Chester F. Carlson Center for Imaging Science. His research included graduate work at the Mind Research Network for Neurodiagnostic Discovery in Albuquerque, N.M., and resulted in image-processing techniques for assessing people with schizophrenia, autism spectrum disorder and bipolar disorder. A sabbatical during his Ph.D. gave Khullar hands-on experience at the Massachusetts Institute of Technology’s Media Lab. He joined the Camera Culture Group and developed low-cost solutions to mobile health care in developing nations. Khullar repurposed mobile phones as medical screening devices for eye diseases and led the team that built an award-winning retinal imaging system for the early detection of diabetic retinopathy and hypertension. A connection at the Media Lab helped Khullar segue his sabbatical into an internship at Microsoft Research in Redmond, Wash. Taking a break during his Ph.D. was a bold move his advisers supported—literally. The generosity of his mentor, Stefi Baum, former director of the Center for Imaging Science, funded Khullar’s time in Boston. That was the tipping point for him. RIT prepared Khullar to be part of the new paradigm in human-machine interaction. The relationship to technology has “empowered people to have more accessible means to understand their health,” he said. The paradigm continues to evolve. Khullar knows this first hand. After graduation, he returned to Microsoft as a post-doctoral researcher where he developed new camera-powered health sensing applications and a camera-based heart-rate system using web cameras. His research also contributed to the heart-rate monitor in the Xbox One Kinect camera. Following Microsoft, Khullar moved to Quanttus Inc., an MIT start-up in Boston, to develop a wearable device for monitoring multiple vital signals. He returned to the West Coast in September 2015 to work on “exciting things” at Apple. Graduates build careers in consumer electronics or the aerospace industry at companies like Apple, Boeing, Google, Lockheed Martin and Raytheon or at government and national laboratories, such as Los Alamos National Laboratory, NASA Goddard Space Flight Center, the National Geospatial-Intelligence Agency and the National Oceanic and Atmospheric Administration.